It's been a long time since I made strudel dough and it's been even longer since I made it for our own eating pleasures. When I first moved to the US, one of my first pastry jobs was at a German bakery where we would make strudel dough by the buckets, starting fresh and early around 3am. I made so much strudels in that one year there that I overdosed a little and never made it at home after that. When I saw that the Daring Bakers challenge for May was strudel I had a split reaction. A "meh" followed by "oh wait I have always wanted to do this and this and this..."
The instructions were to make the strudel dough per the recipe given but allowed us to get creative as far as the fillings, shapes and sizes. I started with one idea and as (most) usual, I ended up with three. My first idea was not to make a traditional strudel and I blame Richard Leach for that. I have been itching to make his Ricotta Cheese Tarts in Strudel Rings since the first day I flipped the pages of his book "Sweet Seasons". I refrained from it up until now because of that studel making overdose mentionned above. Ha! No more! I had the perfect opportunity! For the strudel rings, I rolled and stretched the dough until I could see through it and cut four 1 1/2-inch strips that I rolled around a 3-inch cake rings about 3-4 times. I baked them just until the rings were golden brown. I let them slide of the cake rings and let them cool while I prepared the mascarpone tart base. It is really like a light cheesecake baked right inside the rings. Once they were cooled, I placed them inside the strudel rounds and plated some with fresh cherries and others with lemon balm infused cherries. Both versions were equally good but my heart goes toward the lemon balm one. Of course the strudel dough recipe would give me a lot more than the quantity necessary for the strudel rings. I used the same technique to make slightly higher rings with the intention to use them as baskets for ice cream or sorbet. I even made handles for them but a mini trip over pupp Bailey and the handles flew across the room and broke to pieces. Sorbet cups would have to do. I made Garrett's rhubarb sorbet over the weekend and it was a wonder there was enough left to fill the cups. If you have the chance, run to make it! Absolutely delightful. My only change to his recipe is that I did not strain the rhubarb but pureed the heck out of it. Worked like a charm. Pink, smooth and creamy all at once. I still had plenty of dough to make a traditional strudel like most of my Daring Bakers partners. I filled this one with roasted quince that I had in the freezer and fresh roasted white peaches. I sprinkled a basic hazelnut crumble on the dough before layering the fruits and rolled the dough in a log. In the cacophony of friends coming over for brunch, I completely forgot to take pictures of the log and had just a split moment to take pictures of the small strudel bites I cut for everybody to sample. I found the dough a litte bland at first but paired with a punch of flavors it really took a life of its own and today I am glad to have leftovers of all three desserts to chose from after dinner! See below for all the recipes and my notes. Notes: I used a printed tablecloth so I could see better how thin the dough was getting and how much I could keep on stretching. I found out that no pleats or wrinkles was much better or the dough will take on those at the same time you roll. Take the dough out of the mixer and continue kneading by hand on an unfloured work surface. Knead for about 2 minutes. Pick up the dough and throw it down hard onto your working surface occasionally. Cut four 1.5-inch strips of dough, brush them with melted butter and roll them around cake rings. Bake at 350F until golden brown, about 15 minutes. Cut four 2-inch strips for the sorbet cups. Proceed as with the rings. Notes: this will make enough for 1/3 of the dough. Adapt if necessary. Place the peaches and the quince in a medium baking pan lightly sprayed with cooking spray and roast at 350F for 30 to 40 minutes until caramelized. Check at half time and add 1/4 cup of water to the pan is necessary to prevent them from scortching. Once baked, let cool completely to room temperature. Slice the fruits thin. In a large bowl, stir together all the crumble ingredients and mix with your fingertips until the mixture forms pea size crumbs. Fill the strudel with a layer of crumble and top with the roasted fruit. Roll from the short end, lightly brush with melted butter and bake at 350 for 30 minutes (more if you are doing the whole quantity of dough as a regular strudel). Mascarpone Ricotta Cheese Tarts In Strudel Rings, adapted from Richard Leach. Place all the ingredients in a heavy saucepan and bring to a boil over high heat. Reduce heat to medium and simmer 5 minutes. Remove from the heat and let cool. Strain to discard the lemon balm. Use to decorate the tarts. Wrap four 3-inch dessert rings with foil and place them on baking sheet. Lightly spray the inside with cooking spray. In a mixer fitted with the paddle attachment, whip together the mascarpone, ricotta, sugar and vanilla bean seeds at medium speed, until smooth, about 2 minutes. Reduce the speed to low and add the egg and egg white and beat until smooth, scraping the sides and bottom of your bowl if necessary. Still on low speed, add the heavy cream and whip until incorporated. Divide the mxiture evenly among the prepared cake rings and bake for 20 minutes or until just set. Let cool completely. 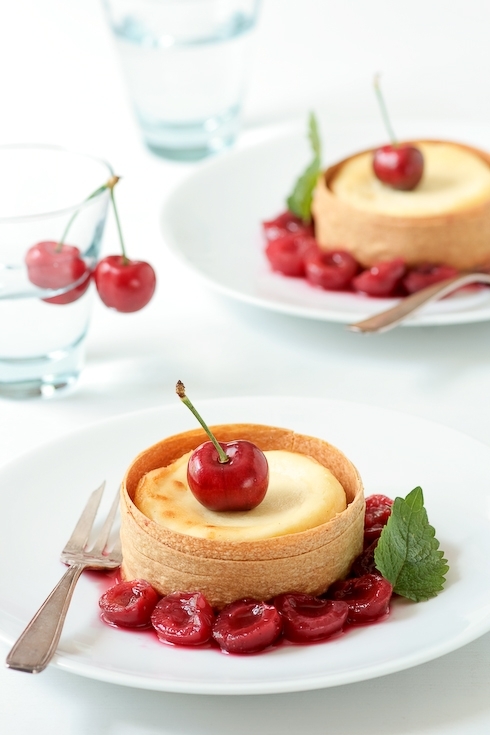 Once cooled, place a strudel ring around each tart and spoon some marinated cherries around the tarts. Rhubarb Sorbet For Strudel Cups, adapted from Garrett's. Placethe rhubarb, sugar, water, and lemon zest in a large and heavy saucepan. Bring to a boil over high heat. Reduce heat to low, and simmer 5 minutes, uncovered. Let cool to room temperature. Working in batches, purée the mixture in a blender until smooth. Stir in the glucose. Cover and refrigerate until completely cold, preferably overnight. Process the ice cream according to your machine's manufacturer's instructions. The sorbet will have a soft texture right out of the ice cream maker. Freeze a couple of hours before serving. Your every creation is so perfect and beautiful. I wish I could come in and eat a little piece of it. Splendid. Ditto Ria. Sigh...gorgeous as always! Mascarpone Ricotta Cheese... that sounds DIVINE!!! You never fail to amaze me with your gorgeous creations! 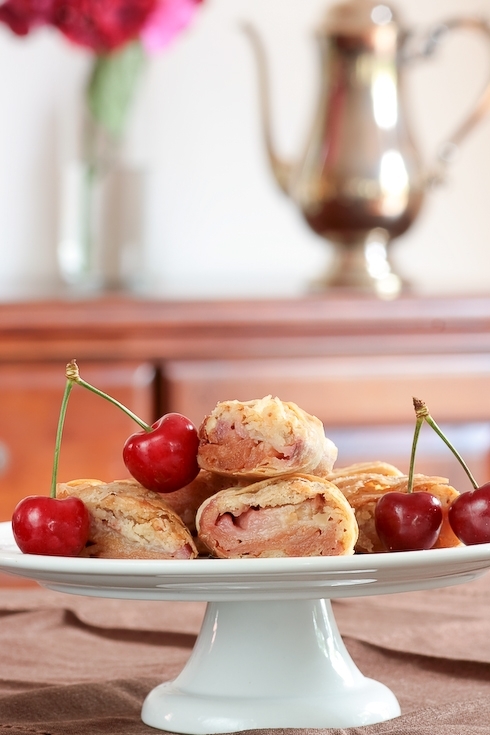 Your ricotta tarts in strudel rings look perfect and so delicious! What a fabulous idea strudel rings perfect way of doing this challenge. Your pictures are ALWAYS so perfect and are a inspiration to everybody. And using the old-fashioned rhuburb is excellent an oldie but a goodie. I will certainly be using the strudel ring idea in my next hig-tea. A pleasure as always. Cheers. What a fantastic way to make these strudels Helen... You're always the first where I am checking the results of the daring bakers and you manage to surprise me each time! Love it!! I actually have a question for you, since you're an expert in this area. I made the strudels with strawberry and mango, but felt that the fluids of the strawberry started spreading all over the baking tray while in the oven and due to that I think I've lost a lot of the sweet strawberry flavour. Do you have a suggestion on how to best handle soft fruits while baking? You know, it doesn't even matter to know if your sweets were good or not. They're such an eye-feast, both for the tecniques and the pictures! what a clever idea. I have never noticed that in his book but I will have to look again. the cherries look perfect! You are just simply amazing, mashALLAH. I always get real impressed whenever I visit your blog, believe me I just simply want to try your creations and I bet they taste as good as they look. I just struck me into a state of speechlessness!! Helen, you never fail to impress us all! P.S. I look forward to the publication of your cookbook!! Simply gorgeous post. :) I love the idea of lemon balm cherries, I would never have thought of that combination but I've earmarked the post to give it a try the next time I buy cherries! I had never heard of strudel rings before this, so thanks. The strudel rings are just amazing. Great idea. I just shake my head at the creativity about the place. Beautiful job, as always. That is fantástic my friend!! You are amazing really, so creative! I am totally amazed at your creativity! Love what you did with this challenge. 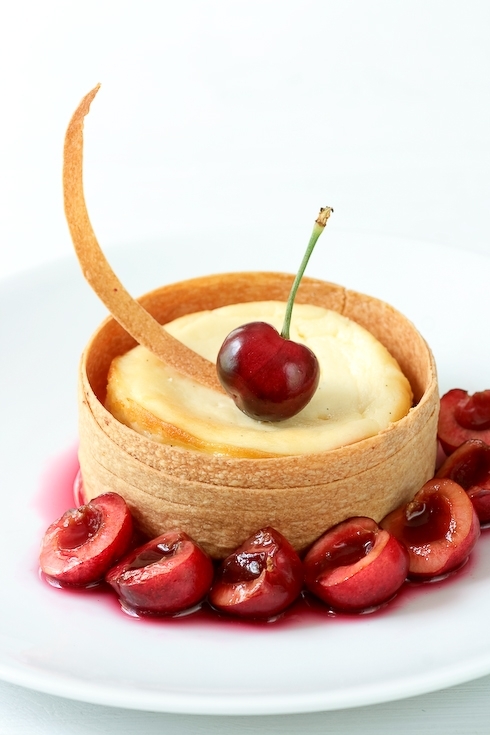 That cherry tart is just stunning. Tes présentations sont fabuleuses. Ça donne juste envie, de retourner dans sa cuisine et de recommencer la recette ! Every DB post here (and all the others too) never fail to surprise me with your creativity. You are the Queen of pastry makers & beautiful desserts Helen. A viusal treat through & through, with path breaking ideas. Even the tradional strudel had a gasp leaving me; I always come fairly prepared to expect the most gorgeous stuff! Great stuff! fantastic idea and such beautiful presentation, your photography is stunning as always. Absolutely beautiful photographs! They make you anxious to get started on the recipes! Strudel cups! and beautiful ideas for ingredients Helen! You are delightful as always! I absolutely love the idea of the strudel rings! And I think my dog trips me when I'm baking on purpose so that she can scarf up all the flying baked goods! OK this is officially the prettiest rhubarb dessert known to man. Just lovely! How beautiful and unique -- what a lovely idea! 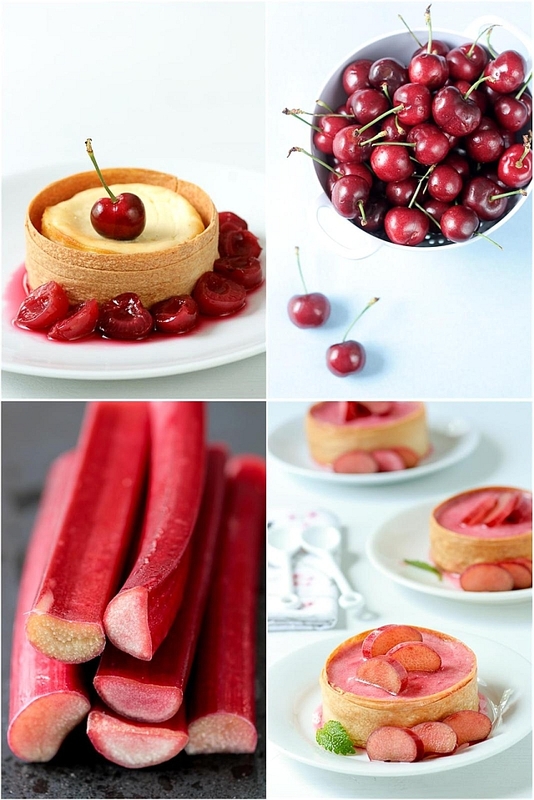 i live the ides of the rhubarb, also love cherries - will have to try both! Such lovely variations! As always I leave your blog feeling inspired and filled with ideas! Great job! Love the strudel rings. Too cute! Such beautiful photographs... I just love your blog! I've always wanted to become a pastry chef but both of Swedens pastry chef-schools are way down in the south (I live way up north...). It seems like a really big step to move but maybee someday I'll take the plunge! Everything looks amazing. I'm going to have to try making the rings--neat idea. Oh wow, you are an absolute genius. Who would have thought of making strudel tarts. These are really really beautiful. I will definitely be trying the rhubarb sorbet recipe, as it's my boyfriend's favorite springtime flavor. Always looking for new ways to incorporate it. Your completed challenge is beautiful as always! Very creative!!! Those are just beautiful! I love the flavor combos you did! Your posts always amaze me! Love everything about this one! Absolutely gorgeous! I can't wait for your book, it is going to be brilliant! This post (and in particular the photos!) is almost enough to make me become a baker. Gorgeous. Thanks. Absolutely gorgeous. I always take the easy way out with tarts by using Phyllo dough, and have never made it with anything but apples, the way my mother did. I'm inspired to try something new and different now! such wonderful creations... oh my. Very elegant. Im glad you got reinspired with Strudel for this challenge. Quelle créativité! je suis bluffée... Bravo! Simone: You can go 2 ways: one is to cook them first for 5 minutes over medium-low heat so that they can render some juice and then drain some before using. The other one is to toss them with a bit of cornstarch before baking. fantastic take on the challenge. Very creative with the strudel rings. Miss daring baker's ...will be rejoining soon! I'm all over those cheese tarts, Helen. With those cherries, I can just imagine the perfect combo of flavors. One of these days, I'll persist, conjure up enough patience, and think about how you make these works of art. Goodness. I couldn't even stay focused long enough to do anything but roll 'em up! Absolutely beautiful. I just love the sight of cherries! As always, your creations are an inspiration! You are so creative! You always come up with the most awesome creation. Love the rings!! I am so glad I don't do this challenge ( I do Daring Cooks). No one could compete with your amazing creativity! I love everything you came up with. And I'm with dishinanddishes, you are by far the best daring baker out there! Brilliant! Beautiful idea wonderfully executed and photographed. Leave it to you to be incredibly brilliant! I just love what you did to your strudel. I am not a big fan of strudel but yours I SO would be a big fan of! Beautfiul Helen! you always come up with the most brilliant creations! Well done! I love your interpretation of the challenge. Really clever! Now here's a different take on this challenge! I'm so impressed with your ideas! Absolutely brilliant! I do not understand how you were able to get the dough so thin, mine was tearing like crazy. I don't think I had enough patience or technique. All three of these versions look sooo yummy! I love your creativity! Wow...you are so inspiring! I love coming here fo your delicious and beautiful takes on food! Amazing pieces of Edible Art. Helene. Iam learning lots from you. I want to thank you also for the beautiful and tasty Matcha creamcheese cake, I made it last week, and was so happy with the result, I forgot the strudel dough waiting to be stuffed with our dinner. You blow me away as usual. ABSOLUTELY GORGEOUS!!! I'm embarrassed for my pathetic strudel. I really want some of that rhubarb sorbet. For breakfast. The strudel rings look amazing-- what a good use for the dough. Oh I love the strudel ring. Pure art! My pup's name is Bailey too, and he is always underfoot even when he knows he isn't supposed to be in the kitchen! You are possibly the only person I know who would manage to have roasted quince in her freezer. I am intrigued by that last flavor combination the most, but love the strudel cup idea. After working in a bakery where I had to make 3 strawberry pizzas a day minimum, it took me 8 years to even want to eat strawberries again. Strawberry pizza? Still not going to happen. OMG! You are freaking brilliant! The pics are so amazing. I sent you a msg to your FB the minute I had sneak peak in the forum and but to see them here is just blowing my mind away! Wow, another stunner, but we expect no less from you. The food is gorgeous and the photos are truly remarkable. Brilliant and stunning as usual! They all look amazing! Love your take on the strudel! I think my heart would have to go to the roasted quince and white peach struddel. Much as I love rhubarb, quince is such a rare treat that I'd make a beeline for it! This is such a creative way of using strudel dough. I love your strudel rings with the ricotta cheese filling. This strudel is a master piece !! Thanks for the tips Helen, I will try that for next time! Add me to those awed in silence. Just lovely and creative. I can't write anything because it would be always less than what is in real! I am just happy and lucky to have stopped here, sure you'll be on my blog roll immediately! Thanks for your ideas, your cakes, your pics! I'll try to learn as much as I can! Your creations are beautiful as always, and I can't wait to make the rhubarb sorbet-I have rhubarb in my garden ready to use. the colors are great...that sorbet! outdone once again helen, gorgeous and so fun too! Everything you do is BEAUTIFUL. Love, love, love you! i am in awe! but then again, i am always in awe with everything in your blog! such creativity. love it!!!!!! Helen, you've certainly strutted your strudel here! Your pastry is crazy crazy thin! I love the tart idea too. How creative! Great job on this month's challenge! Creative and beautiful! I love the strudel ring idea. Your pastry is amazing, so thin! Stunning! Helen, Helen, Helen!!!!! I hate to repeat myself as I have said this before to you, but again....I am speechless!!!! They all look and sound amazing - as I knew they would!! How beautiful! And lovely to know I can do something so elegant with the strudel dough. I love the strudel rings! Beautiful and creative! Your DB posts are always such a delight. I wish my whole kitchen were covered in giant photos from your website. Fantastic! SO creative and they all look amazing. Speechless. Every time you post something I am stunned and I cannot put in words how delightful everything you do is. wow--those rings are just beautiful! and i totally would have thought strudel dough to be too flimsy to work with like that. great job and the flavors sound divine! I love what a creative perfectionist you are. Every recipe must be tried at least three different ways. And, of course, all of them are beautiful. Well done! You once again put me to shame, Helen!! Coming up with 3 versions of this month's challenge...and I haven't even done mine yet!! Brilliant...the roasted quince and fresh roasted peaches one is making me drool all over the keyboard! it's just beautifull as usual !well done for the ring. you are always what i aspire to be but somehow come baking time, i am always running around like a headless chicken...then i bake read you blog and say, next challenge! Fabulous job Helen! I love your strudel circles...it's such an elegant presentation for the tart too. You are a baking inspiration for me. How many tarts would that dough yield, if used precisely as you have used it here? They look so very lovely!!! You have the best presentation ever. Bratsky: with the dough fully stretched to capacity, I'd say 16-20 depending on the width of your strips. You poor girl, making strudels at 3am! Me too, I would not make any strudel at home after that! But that's such a gorgeous dessert Helen! I think that must be even better than the real strudel! 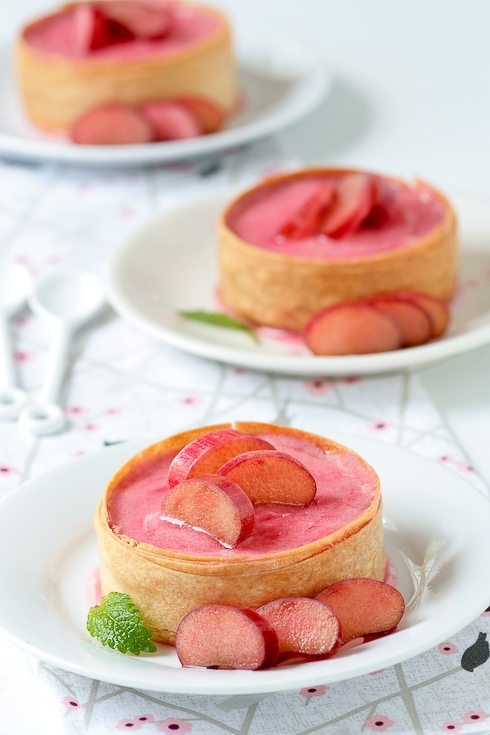 Ces tartelettes sont adorables, un vrai délice! Tartelette kikou .. I have just taken the time to read some notes and I see that you are born in May .. I am also of the same sign as you ... a good bull who loves and loves life .. I see through your beautiful photos and written .. I will write you to google translate and I think the translation may not be good .. but hey, you have the tone of the message and it is with happiness that I 'I discovered a wonderful blog full of light. I went through the beginning of your blog and that way since .. we see the difference from month to month and it is sublime .. you own this pugnacity and magic that makes all the difference ... I will follow if you would, with pleasure and passion ... that of the kitchen and the picture ... it's the happiness in every ticket we offer you ... thank you ... see you soon. Loving your blog! Everything you make is so tempting. Great inspiration for me as an aspiring pastry chef. I have posted a Lovely Blog Award for you on my blog. Wow...that is awesome! I love how creative you got. Both versions look great but the ringed version is quite cool! Your strudel rings look awesome!! I love how you made the recipe your own =D. So creative yet again! And I never thought strudel could be so beautiful! WOW, Helen! You're always so creative and different during each challenge. Absolutely adore your creation. WOW Helen, I love how your strudel looks. You're always so creative and different each time. I adore your strudel. Your peach strudel looks so innocent yet very sophisticated...and more than likely addicting! I got my mom hooked onto your blog! 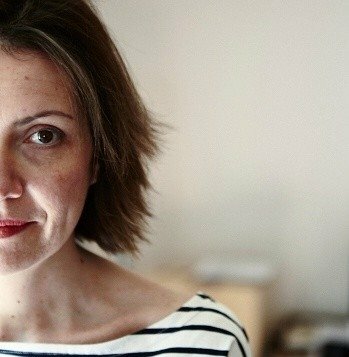 She fell in love with your eye for miniature scale, photography, and creative thinking. Wow! Three for the price of one?! Now that's just impressive! Those strudel cups with the ricotta tart look amazing. I wish I could've had that for breakfast. And, of course, the traditional strudel looks amazing, too! Such a creative baker! gorgeous, gorgeous, gorgeous. they all look simply divine! WOW! Absolutely stunning creations and awe inspiring. Your food photography and styling also amazing. Love the cherries are beautiful!!! Wow. Those pictures are absolutely amazing! Thanks for all the inspiring recipes and ideas. Really love coming here and getting excited about baking. WOW. I have no doubt that all of your creations were as tasty as they are beautiful! I am just giddy at your prowess. Just stunning. I don't even know what to say... If there where a more perfect strudel, it would have to be made of gold! Absolutely beautiful, and so very creative, as always. So amazing! Everything is gorgeous! Gorgeous! I had strudel disaster...never even photographed it! You never cease to amaze me, Helen. Outstanding (of course)! i am curious about the process of freezing roasted quince. do you have advice or instructions? Eri: I am assuming you want to freeze it cooked, right? If so, make sure to store the cooked quince in a glass container, no plastic for up to 3 months.